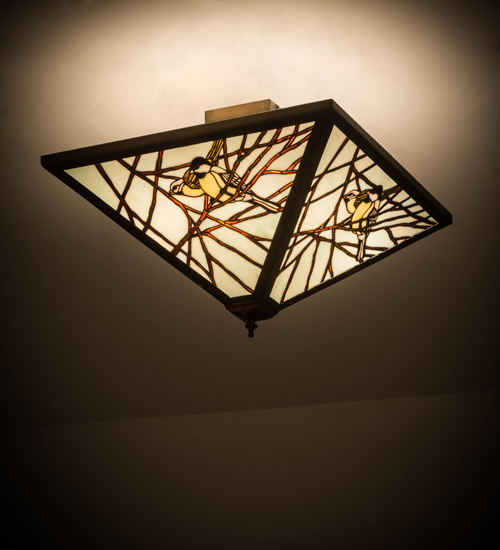 Description: Bark Brown and Golden Ripple Glass branches across a Celadon sky make a pleasant repose for these birds that are often seen in the backyard.A Meyda original design, the shade is created using the famous Meyda Tiffany copperfoil construction process. The frame and hardware are featured in an Antique Copper finish.Custom colors, designs and sizes are available, as well as dimmable energy-efficient lamping such as LED. The fixture is UL and cUL listed for damp and dry locations.